PROA, Praticagem dos Rios Ocidentais da Amazônia (Piloting of Western Rivers of Amazon), was founded on 10 January 1993. It is formed by 20 Pilots, approved in an examination held by the Direction of Ports and Coasts - DPC, a department of Brazil Navy, in charge of overseeing pilotage services throughout the country. It is headquartered in Itacoatiara, a City located 270 kilometers far from Manaus, or 102 nautical miles on the Amazon River. It has a representative office in Manaus, addressed on Boulevard Sá Peixoto, 275 - B, in Educandos district, which favors the movements in the ports established in the central-west zone of the city (Roadway, Torres, Milling, Port Chibatão and Superterminais). 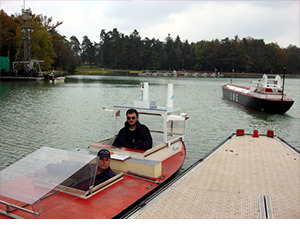 It has its own speedboats for loading and unloading of Pilots and for operational support, all of them in a continuous process of maintenance, in order to ensure their homologation, once they are supervised by the National Council of Pilotage - CONAPRA - through its Technical Council, which is formed by professionals with training, courses and lectures in organs such as the IMO (International Maritime Organization - London), CIAGA (Instruction Center Almirante Graça Aranha - Rio de Janeiro), IMPA (International Maritime Pilots Association - London) and Port Revel (France) among others . PROA has a staff of 22 employees, working in administrative and operational areas. This team is compounded mostly by college-educated professionals and others with great decision-making skills, and they are able to perform their activities with maximum safety and professionalism. Its watchtowers are located this way: one of them is in Itacoatiara city, in a strategic point with total vision of the points of embarkation and disembarkation of Pilots. PROA is equipped with VHF and HF radios, online computers, emergency generator, weather station, living and leisure rooms, as well as sleeping accommodation for Pilots; a second tower is located in Amazonas state capital, Manaus, by the Educandos riverside, from where it controls the logistics required to meet the pilots service throughout the Western Amazon region, which covers the city of Itacoatiara up to the border with Peru and Colombia, in the city of Tabatinga. Besides the Watchtowers PROA also has a support houseboat nearby the Meeting of the Waters, the most visited tourist attraction in the state. 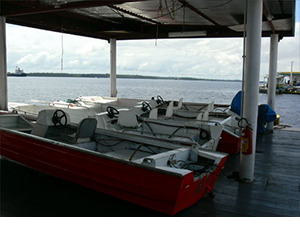 The houseboat has four (4) surveying boats, which allow quickness in the motion for the ports of eastern area of Manaus (REMAN Terminals and Vencemos Port). PROA is the only company of piloting in the Western Amazon equipped with all equipment and boats required by Brazilian law, and two Watchtowers duly recognized by the national piloting organ - CONAPRA - and by the Maritime Authority. PROA makes substantial investments in everything that can bring it to the forefront of important events in its segment of activity. It keeps its system standing by 24 hours a day, during the 365 days of the year to better serve any costumer or provider in the need of piloting service. Therefore, it has communication system via SSB and satellite (Globalstar, Iridium and Inmarsat Began) for monitoring ships sailing along the Solimões River and its tributaries; VHF system that covers the distance between Manaus and Itacoatiara perfectly, keeping thus constant updating of ETA (Estimated Time of a Arrival) of the ships, contributing for the achievement of their schedules. 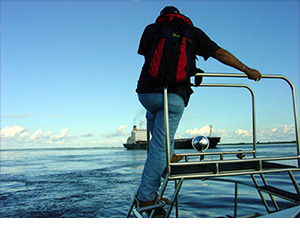 In order to improve the service it provides, PROA continually invests in training, equipment, formation, and improvement of the observations on Amazon nature, aiming inalienably the reduction of risks on the navigation, the human life and the environment, maintaining its ethical principles which are required from a service of such importance to all of the Amazon society.